Plus, the Trump administration plans to roll back Obama-era climate change rules. 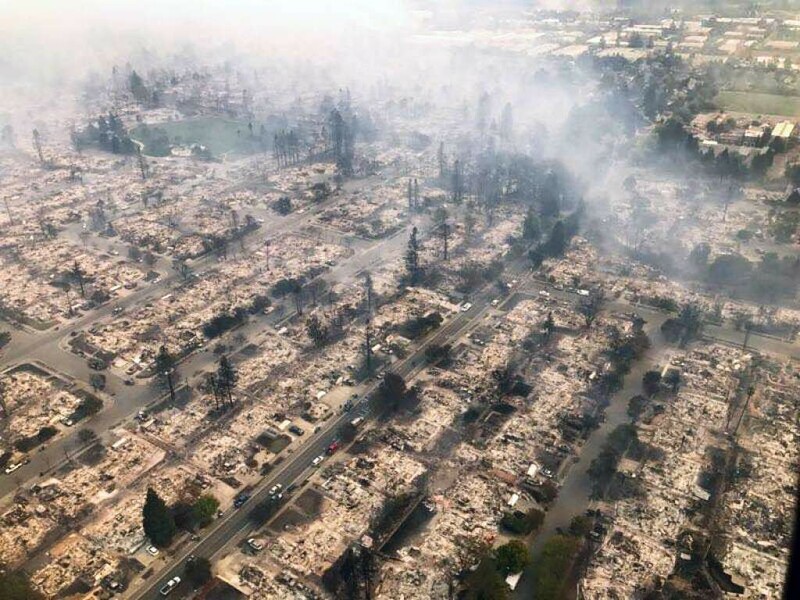 The Tubbs fire destroyed the Coffey Park neighborhood in Santa Rosa. 1. The massive fires that have ravaged Sonoma, Napa, and Mendocino counties have killed at least 13 people, and 150 people have been reported missing, the San Francisco Chronicle reports. The blazes have destroyed at least 1,500 structures and burned more than 100,000 acres. The so-called Tubbs Fire, which began near Calistoga and swept through Santa Rosa, wreaked the most devastation, leveling entire neighborhoods and prompting tens of thousands of residents to flee. Several wineries, restaurants, and iconic Wine Country businesses also burned to the ground. 2. Wildfires are also ripping through Yuba, Butte, and Nevada counties in the Sierra foothills, torching 20,000 acres and forcing widespread evacuations, the Sacramento Bee$ reports. And a major fire in Orange County has destroyed at least 24 structures, the LA Times$ reports. The blazes, like the ones in the North Bay, have been fueled by hot, dry autumn winds. 3. Trump administration EPA head Scott Pruitt announced that his agency will roll back Obama-era climate change rules, The New York Times$ reports. The move will overturn Obama’s Clean Power Plan, which was designed to slash greenhouse gas emissions, and will make it unlikely that the United States will live up to the Paris climate accords. 4. Tens of thousands of Puerto Rican residents continue to flee to the U.S. mainland, three weeks after Hurricane Maria devastated the island, the LA Times$ reports. As U.S. citizens, the evacuees have the right to move to anywhere in the country. And the Trump administration continues to come under fire for its slow-footed response to the Puerto Rico disaster. 5. And the Washington Post$ reports that President Trump made at least 1,328 false or misleading statements during the first 263 days of his administration. He has averaged five false or misleading claims a day.